Do you want a totally different look and feel in your bathroom? How many times a day do you wish you had more space in your bathroom? Custom bathroom cabinets (also known as bathroom vanities) can be just the solution to creating unique and functional bathrooms that stand out. Bathroom cabinetry is a functional piece that is often overlooked, yet plays a major part of making the most of the space in your bathroom and can also be a major centerpiece (if properly designed). With the right kind of planning, your bathroom's cabinetry can be make your bathroom remodeling project a success. Our infinite design options give you the style you want. Our white-glove nationwide delivery gets them safely delivered to you. ...or your own custom style! ...or any style you'd like! ...or any other finish you want! These choices are to give our customers a general idea of the many options we offer however, they do not include every idea or choice available. The options are endless, thanks to the creativity of our designers and expertise of our skilled craftsmen. Looking for some design inspiration? Visit our project gallery for photos from recent custom bathroom cabinets we've completed. Ready to Get Custom Bathroom Cabinets? Contact us today to schedule an appointment with one of our expert bathroom vanity cabinet designers! We can talk over the phone or in person at our Lebanon County, PA showroom. At RM Kitchens in Pennsylvania's Amish Country, we hand craft every bathroom vanity under our unique line: Spring Hill Cabinets are "one of a kind...every time!" From choosing the design style, to having unique finishes created for your cabinets, when you choose Spring Hill Cabinetry you not only get a unique product, you also get a product that has a strong reputation for its high quality. In fact, we've been making stand out cabinet products since 1969, and to this day, we still work to produce an individual cabinet product for each and every customer. We custom make every cabinet, which means you get to choose the overall style, cabinet door style, and the finishes you want. Why Choose Spring Hill Custom Cabinets? If you're looking for custom built bathroom vanities online, you're probably seeing many different options... but how do you know if they're actually well-made and able to withstand the test of time? When a customer chooses Spring Hill Custom Bathroom Cabinets, they are choosing to design a completely unique, custom crafted product. When we talk about "craft cabinetry", we mean that all of our custom cabinets are hand-made right here in our own Pennsylvania factory. From start to finish, we work to produce a product that will fit your home's unique style. We allow our customers to tour our workshop so that they can get a feel for how their cabinetry is made. All of our custom cabinetry (including bathroom vanities) are of the highest of quality and all of our cabinet makers adhere to the highest of standards. From the minute you first contact us, to the moment your cabinetry is installed, you can be assured that you are getting the best in workmanship, customer service, and cabinetry. If you're looking for custom bathroom vanity cabinets made in the USA, you're in for a treat. All of our cabinets are made right here in our Pennsylvania workshop. If you are looking for unique cabinets for any room in your home, contact us today! Let your home be a space that you can't wait to walk into every single day. Nationwide shipping within the continental USA! 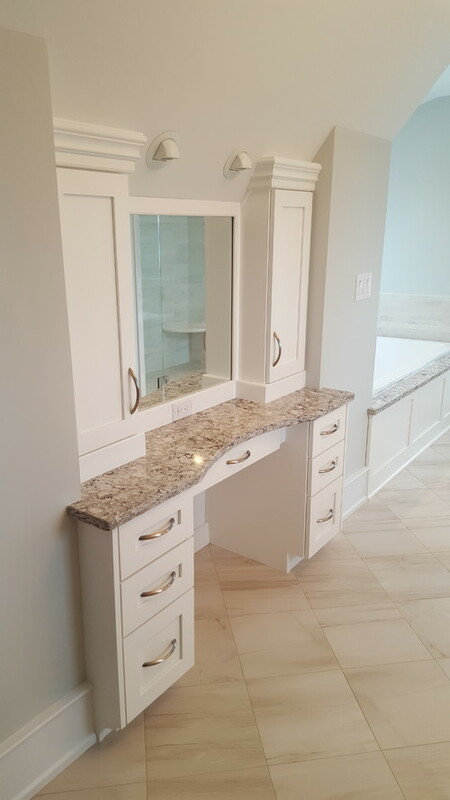 We personally install custom bathroom vanity cabinets in Harrisburg, York, Lancaster, Lebanon, and the surrounding Central PA area, including Camp Hill, Mechanicsburg, Hershey, Carlisle, and Reading, PA. In fact, if you live in the area, we offer complete custom home remodeling services (including kitchen remodeling and bathroom remodeling). Our cabinets are hand crafted in the USA right in our manufacturing facility located in Pennsylvania's Amish Country (specifically, in Annville, PA). Each cabinet is hand crafted by our expert craftsmen who are involved with production for each project from start to finish to ensure the quality, fit and finish required by our customers. Our manufacturing facility is just 3 miles down the road from our custom cabinet showroom and is frequently toured by our customers. Click here to schedule a visit to our showroom and manufacturing facility. Not sure what you'd like your new bathroom cabinets to look like? Or maybe, you already do. In any case, our expert bathroom cabinet designers are here to help you create your dream bathroom. We are experts at designing around difficult spaces and can help you solve any room-design challenge! Our made-to-order bathroom cabinets are designed and built by us. To ensure the best quality, we don't outsource. All of our custom vanities are made to your specifications right here in the USA. These aren't cheap RTA cabinets (ready to assemble) that come from China. We only use the best materials available. Our exert designers are with you for every step of your project. You'll receive personalized service and we take care of all the details. We offer white glove nationwide delivery. Our delivery trucks travel up to 250 miles from our PA location. Outside of that, we use a specialty furniture delivery company to ensure quality. Are you looking for inspiration for your bathroom remodeling project? Need some unique space saving cabinet ideas for your bathroom renovation? Our expert designers and contractors have designed and installed hundreds of remodeled rooms. 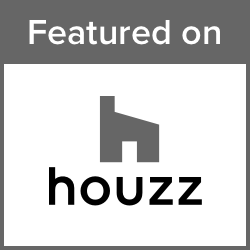 We've tackled many unique projects including difficult spaces, space saving ideas and outdoor kitchens. Check out our online project gallery for ideas from our latest remodeling projects including kitchens, bathrooms, family rooms, entertainment centers and much more. Our showroom is located in the front of our sales and design offices in Annville, PA and show cases many of our custom cabinets in a variety of settings including kitchens, bathrooms, and other rooms in the home. Our showroom is open Monday through Friday from 9am to 5pm. You are welcome to drop in and our designers are available by appointment to review design options and help you with ideas and get started designing your custom room. Click here to schedule a consultation in our showroom with one of our designers.